If you're able to dig down and find the courage to act, you can quickly earn big returns. It's often easier said than done, though. After all, are you excited to buy stocks right now? Are you itching to put money to work after the beatdown we've seen in recent weeks? Most folks fancy themselves contrarians. But when it comes down to it, it's hard to pull the trigger when stocks are getting crushed. That's the best time to put money to work. And the recent market sell-off is setting up a big opportunity in a global tech juggernaut. History says acting now could lead to 31% profits over the next year. If you want to make the biggest gains, you've got to buy after a company takes a beating... and then begins to recover. We have that opportunity right now in a $70 billion chipmaker. Qualcomm (QCOM) is down 23% since mid-September. The company engineers technology for cellphone makers, wireless carriers, and governments around the world. And while the stock market has struggled lately, Qualcomm has taken an even steeper dive. This big fall is creating an opportunity, though. The company recently hit massively oversold levels. And that suggests a rally is likely. We can isolate "oversold" levels with the relative strength index ("RSI"). This indicator tells us when markets have gotten ahead of themselves... if prices have moved too far, too fast, in either direction. Qualcomm took a beating in recent weeks. And that pushed the company into oversold territory, as the chart shows. Qualcomm has been a massive winner... returning roughly 17% a year for more than two decades. But buying after RSI levels like we saw recently has led to much better returns. Similar oversold levels led to 10% gains in six months and a 31% gain over the next year, on average. That means folks who have the courage to put money to work today could see fantastic profits. The good news is that Qualcomm is already beginning to recover. The stock is up 7% in just a few weeks. And that makes putting money to work much safer today than it was in mid-November. 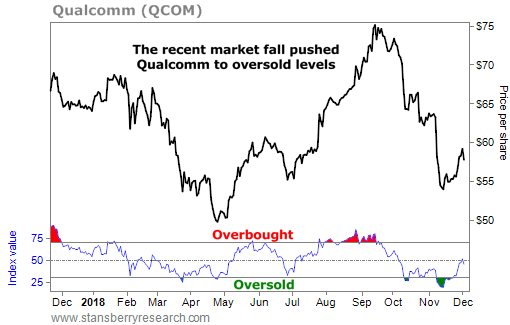 History says Qualcomm could be setting up for a 31% rally. So, if you're looking to put money to work after this market sell-off, this tech juggernaut is a great opportunity today. "When you see a hated asset entering an uptrend, that's when you want to put real money to work," Brett says. Learn more about a surprising asset that could be poised for a rally in the months ahead right here. Regular readers know Steve and his team use oversold levels as one of their favorite contrarian indicators. Chris Igou recently found another kind of signal for one sector that could lead to a buying opportunity... Learn more here. We’re talking about Etsy (ETSY). The company runs an online marketplace for sellers of handmade and vintage goods. Amazon has tried to infiltrate the crafts space with its Amazon Handmade platform, which added a “gift shop” last year. 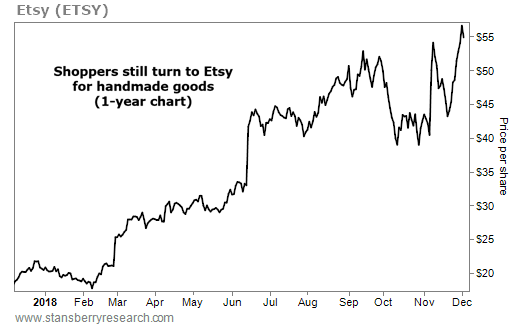 But that isn’t getting Etsy down… According to its latest earnings report, Etsy’s gross merchandise sales – the total sales made through its website – grew 20% year over year. And over the past five years, its revenues more than tripled.